Seven miles north of Pittsburg Village and one mile east of U.S. Route 3 on the road to Lake Francis State Park. It spans Perry Stream. The bridge is 50'6" long with a clear span of 41'9". It has an overall width of 16'10" with a roadway width of 13'5", and a maximum vertical clearance of 11'2". The structure is closed to traffic. 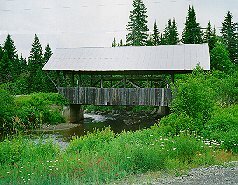 Little is known about this bridge and nothing has been recorded in the town records. It has now been bypassed. The bridge is closed to all but pedestrian traffic. Periodically, volunteers have undertaken the cleaning of the bridge and minor repairs. The River Road Bridge is eligible for listing on the National Register of Historic Places.